Introduce your baby to cute cuddly animals with touch and feel textures. 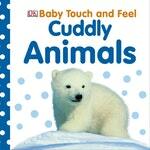 Tickle and touch the textures together with your baby and help them discover all about Cuddly Animals. Let their little hands roam to find a shaggy-haired pony, a fluffy lion cub and a fuzzy-tailed bushbaby. Twinkly, fluffy and fuzzy textures in a chunky package: perfect for encouraging tiny fingers to explore and tiny minds to develop. Sturdy pages with tactile covers and rounded corners mean these books will last years of reading. Love Baby Touch And Feel~ Cuddly? Subscribe to Read More to find out about similar books.